The Shift office was redecorated recently and those of us who share the office with Shift, tidied up our desks. There were so many magazines to be dumped and I could not help asking to have them because I’m a magazine maniac. There is no greater pleasure than getting magazines for free! I went to a convenience store to buy a bag in a happy mood and came home staggering with the bag fully stuffed. Reading magazines is one of my favorite activities at bedtime. The most interesting magazine in these was an out-of- print digital magazine “Wired (Japanese Edition) August ’95”. Whenever I see the magazine in a secondhand bookstore, I end up buying it. The good page layout, the nice photo quality, the outspoken critics — it had a total balance and was really cool. That issue was so popular that it was sold out. I failed to buy the issue. Steve Jobs, before his return to Apple, made the cover and was featured. I think the interview was novel. To great amusement, you can find the Brian Eno interview. These two interviews make the magazine intriguing. Why do I prefer magazines to books? It is because magazine reflect the times and social situations. Only the author exists within books like literature. As they are characteristic features of books, books can achieve universality. Within magazines, you must find feature articles and small columns. Advertisements and events are valid for only a very short time and they become useless after a while. But for me, reading the information lets me reexperience the times. All sorts of information with all different size are there. I enjoy the miscellany. My point of view is different from the magazine producer’s intention. 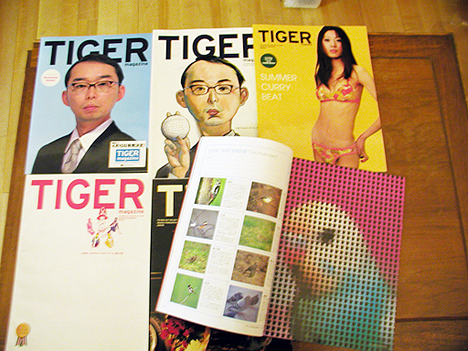 I’m one of the editorial staff of “TIGER MAGAZINE“. This magazine was launched in 2001 and is a culture magazine disseminated from Sapporo. Local people and shops tend to be featured. In that sense, it is regarded as a community magazine. The magazine doesn’t deal with faraway affairs but rather familiar things to us. They deal with things in an original method and won’t introduce ordinary articles. These are what the magazine featured before: “Pitch and Catch”, “Curry (with supplement of spice)”, “Community (about regional currency, etc)”, “TVH”, “Bird (bird-watching & grilled chicken)”, etc. They are more than information and minute introductions of items and the interviews have a great power to attract people. That is the reason why the magazine has many readers from all over Japan and big fans are subscribing. The magazine won the grand prize in the Sapporo Art Directors Club‘s competition. I sometimes have opportunities to talk to the community magazinesﾕ staff. They always say, “There are not good cultural materials in Sapporo”, but I disagree. There are so many things to be picked up and reading those magazines, I don’t feel they have tried every aspect. They prefer to deal with similar topics. I won’t make accusations because they have to consider their business relations. The field staffs may not have enough time to explore the subjects either. In such a hard situation, Tiger Magazine is a unique existence. The production has neither an excessive powerful atmosphere nor positive power. But it’s not that they have low spirit. There is an unexplainable chaotic atmosphere. Something comes out of that energy and is poured into the outer world, then finally forms the magazine. The free magazine “TIGER FANG” will be released on late June and the new issue of Tiger Magazine will be published in late July. It features the music scene in Sapporo. There are practical articles about the “way” to act independently. The magazine is available in major bookstores in Sapporo. You can ask me further information by mail. Please have a look at my site “Numero Deux” where you find the brief introduction of the magazine.